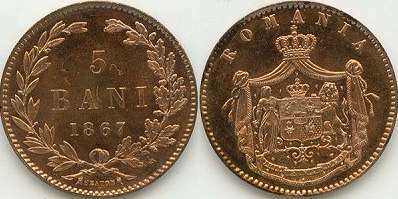 The four coins struck in 1867 were made by two mints: Heaton in Birmingham and Watt & Co. also from Birmingham, so that there are two sets of slightly different coins. On the lower reverse we can read the mint name, Heaton or Watt & Co., except for the 1 ban coin struck by Heaton which for lack of space has only an H. The sides are placed as on medals, the normal viewing positions pointing likewise. 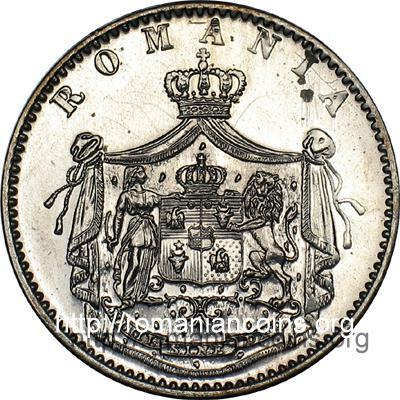 "I have another information, about the Heaton/Watt coins: probably some proof like coins (the Americans offer them directly as proofs) will appear on the Romanian numismatic market. All of them are Heaton! About three years ago a lot of more than 1000 pieces was put to sale, offered compactly, from Switzerland. The lot came from England, being the collection of the Heaton Mint, probably the last part." It seems that the Heaton owners had a very developed numismatic sense, because they retained the first coins struck with new dies, pieces that have a very good quality and proof like aspect. Today, after more than 100 years, these coins are much more valuable. 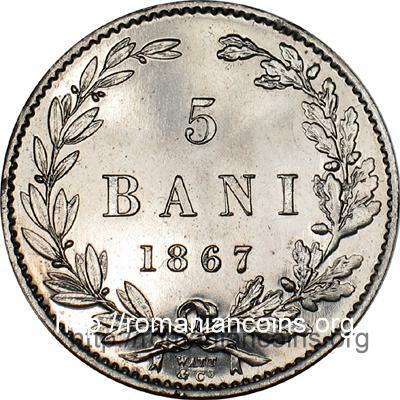 The patterns for 50 bani, 1 leu and 2 lei 1869 coins, presented in the pattern section of our site, are from the retail sale of the Heaton collection too. 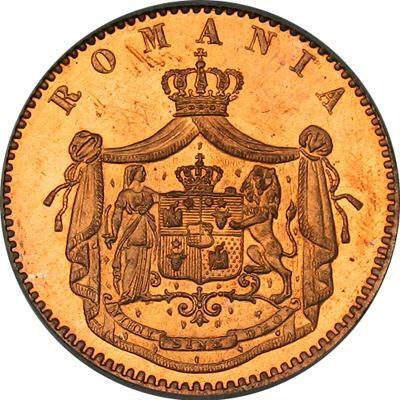 Into 2007 140 years were commemorated from the voting of "Legea pentru înfiintarea unui nou sistem monetar si pentru fabricarea monetelor nationale" (Law for establishing a new monetary system and for manufacturing national coins) by the Parliament of Romania. 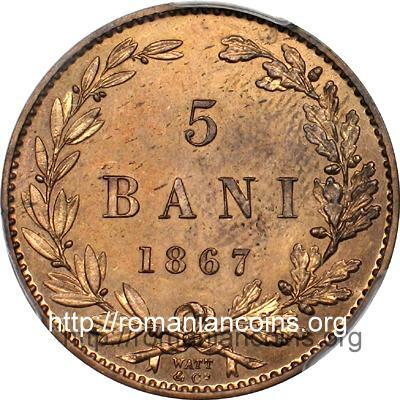 With this occasion the National Bank of Romania issued a set of four replicas of 1 BANU, 2 BANI, 5 BANI and 10 BANI 1867. All the replicas are made from gold (with title 99.9%) and have the same diameter as the original coins. The replicas are heavier than the original coins: 1.75, 3.5, 8.75 and 17.2 grams instead of 1, 2, 5 and 10 grams. 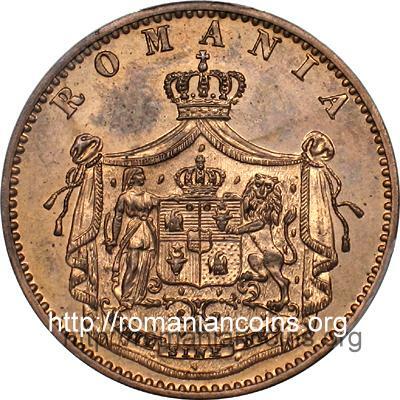 Each coin was issued in a mintage of 250 pieces. Under the ribbon that ties the laurel and oak branches lies an R from replica instead the name of the mint. The replicas are made at B.U. quality. The term BU - brilliant uncirculated - means uncirculated coin with the mint luster intact. In order to obtain a BU coin the dies are carefully polished. The blanks are also polished, in this way the coins having a luster far superior to the luster of the common uncirculated coins. 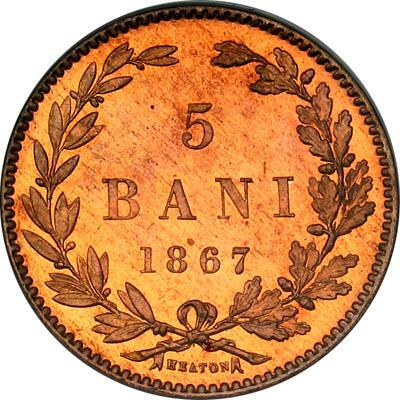 The pictures of the 5 bani 1867 coins above and the detailed pictures with the mint names are present through the kind permission of an anonymous donor.